It has become a tiresome cliché to see tai chi used in films, appearing for a few seconds in a movie to convey the sudden attainment of “inner peace” or equilibrium with one’s ambience for the protagonist. As Leonidas might scream: This is Ireland! This is more likely: You live in a flat so damp that moss grows on your bed, you cough up blood from tubercular lungs; half-fish wriggle under the floorboards, and gurgling sounds from the kitchen harmonise with the sound of frogs. It is so dark in the winter morning that you dress like an Inuit all day and don’t undress for bed. The living room is tiny, with a cell window so high up it can’t be cleaned, letting in light just dim enough for ferns to curl up from your dirty socks. Trying to practise in small apartments seems impossible and you have to move furniture, splitting your shins and stepping on translucent shrieking cats with foggy eyes who are mew mute. The central heating has broken, so cumulus clouds emit every few seconds from your blue konk as you strain to see through the glacier-blue gloom. Wrapped like a clumsy mummy, you move like a slow zombie having a stroke and dream of the scenes above. While I exaggerate, the essence of the above was my situation for many years in a dark flat. I made progress, but mostly through standing. It was too cold outside to practise tai chi for most of the year, and I still don’t do it much, on account of my desire for privacy as well as avoiding the inevitable “gurriers” who sidle up speaking their guttural anglo-klaxon, trying to follow me and asking me if I ever did “Ka RA ee”. 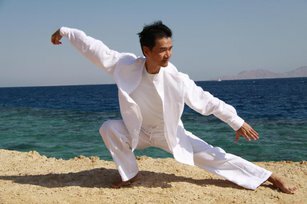 The trope of Tai Chi as a symbol for Oriental Inner Peace is compelling, powerful, and no doubt based partly on truth, if you leave out the vicious martial applications that were sandpapered out of it by Yang Cheng Fu. Translated to the west, the trope of fluidity on a beach with white silk flapping in the breeze has hardened into a pretty shell; nice to look at, but empty. The video of Yang Sau Cheng doing his form with the light in the background is not a pretty thing to see, except for those with eyes to see. He is in everyday clothes, and the room is standard Hong Kong; it looks hot and humid. He seems rigid in some moves, but this is a mis-seeing. Often, parts of the body have to be kept still to allow for internal movements. It is a subtle masterpiece on flickering celluloid, an ironic counterpoint to the operatic martial extravaganzas that would soon be made in the self-same city.